Saturday was Christmas. I know it’s only the 21st, but sometimes you have to bend to meet the situation. This morning, Rick and I ran out on our errand. It’s a ways down to South Elgin, but it is definitely worth the trip. 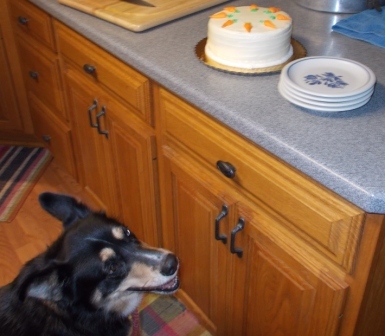 We went to Herb’s Bakery to pick up a carrot cake that I had ordered for Sascha’s fifth birthday. On Christmas (or around there somewhere), Sascha celebrates her birthday. Rick decided that we needed to get the cake from Herb’s. I had called in the order. It’s amazing how many decisions you have to make when ordering a simple cake. Herb’s cakes are definitely worth the effort. The cake was carrot with cream cheese frosting and cream cheese in between the layers. Apparently, there is a fancy frosting you could get, but I went with the plain since Rich and Rick aren’t fond of nuts. I got back to the house and was able to clean up. From there, Rick wanted to open gifts. He donned his Santa hat and began handing out packages to individuals. Sascha got to open her gift first. The Perez family sent Sascha a little something. 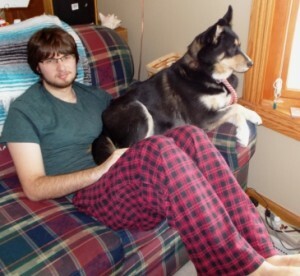 We work with Carolyn and Sergio, who own a full Husky named Professor Fuzzibottom. We tried to get Sascha to open the package herself, but she just didn’t understand the concept. It was a green alligator with 8 different squeakers. It has become the toy that she lays on in the office now. Our tradition is to open each gift and rotate through each of us. I thought we all did well. The guys might have wanted more specific gifts, but I didn’t think they did too badly. Rick had gotten one of his gifts early. He received the components to build his own computer from his father. Being technical or a software developer means that you have to understand what it takes for a computer to work. Building one is the best way to learn. Let me tell you from personal experience, it’s a lot easier now than it used to be. 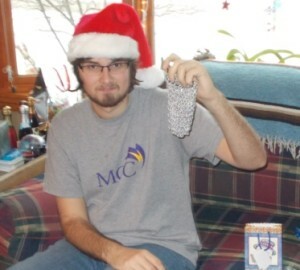 Rick’s face was priceless when he opened the chainmail pouch. I thought it was interesting and a good additional to his Ren Faire outfit. Maybe not. Rich got a new license plate holder for Sally. He picked it out for me to buy. So I know he got what he wanted. 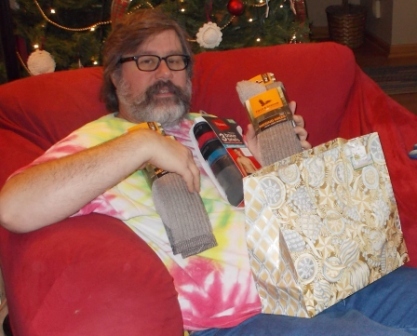 There was the usual beer calendar and undies, plus the new hiking socks. It wasn’t a hint, but he received items to help him organize his tools in the new garage. 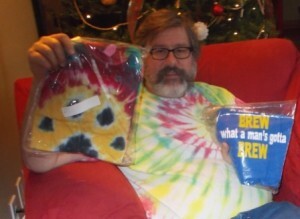 He got a couple of t-shirts with sayings. I got my calendars and chocolates. They are pretty well shared with everyone here though. I got a Colts t-shirt that looks like a jersey and champagne for my mimosas and Black Velvets. 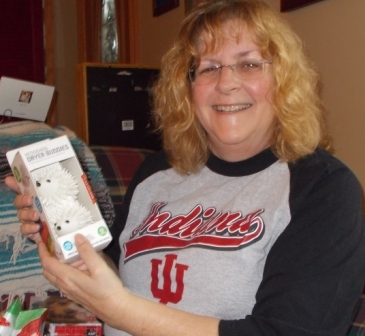 I like the practical gifts. The guys gave me hedgehogs for the dryer. Since I can’t use fabric softener, the hedgehogs are to help with softening the clothes. These little spiky plastic guys are just thrown in with the load to tumble the clothes soft. I tried them and I thought they did a good job. It was time for our traditional Christmas dinner. Rich had been working on the rib roast all morning. The smells in the house were wonderful. 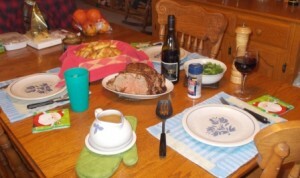 Our dinner consists of rib roast, or roast Who beast and Yorkshire pudding. This is also Rick’s favorite meal. We enjoyed our meal and family time. After cleaning up, we had dessert and our celebration of Sascha’s birthday. Around Christmas time, Sascha was born. Her original name was Holly to honor her birthday. She turned 5 this year. This year, she responded when we sang, “Happy Birthday.” She danced around and was very excited. Then it came time to cut the cake and hand out the pieces. Rick gave Sascha hers. As soon as the plate hit the floor, the slice of cake was gone. I swore that I could hear it being sucked in. Now it was time to get Rick packed up. I had washed the new t-shirts and other clothing items. Rick repacked some of the items so he could take the new clothing. Then it was time to take him to the Gregorys’ house. Loading up the car, I drove him over and said good-bye. I would miss Rick. It wouldn’t be the first time Rick has been gone, but it’s been some time since he has been gone for this length of time. Back home, Rich and I settled in for the evening and the next two weeks without Rick. So we thought. Around 5:00, Rick popped into the house. 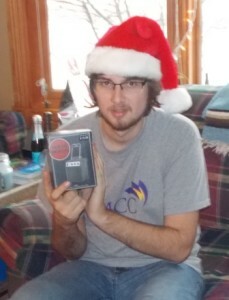 Apparently, it was decided to pick up another controller for the PS3 for gaming while on vacation. For a second time, I said good-bye. Rich and I passed the evening quietly and making plans for our vacation. We are planning to go to Michigan for a few days. Otherwise, we have several projects around the house as well as the opportunity to fix some foods we’ve wanted to make for a while. Rich is a great gourmet cook and vacation gives him the time to cook. I plan to eat well. 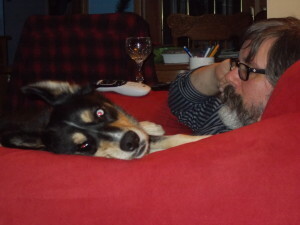 Rick and Sascha enjoying some time. 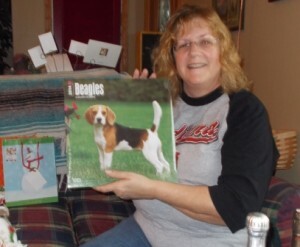 I got my annual Beagle calendar for the kitchen. 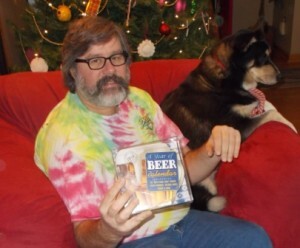 Rich got his beer calendar for his desk at work. 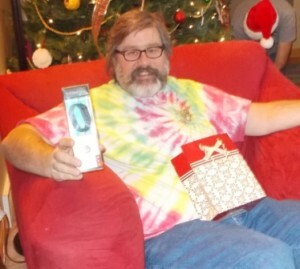 Rick was happy, but he didn’t look too happy here with the mini Marshall amp speaker for his phone. 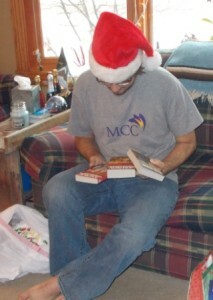 Rick got more Asimov’s Robot series books. Reading for his trip. 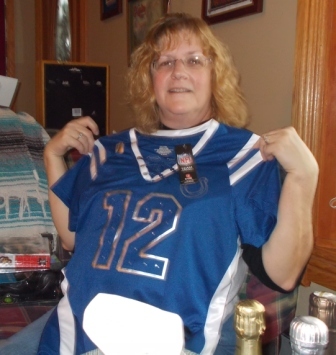 Now I can celebrate my Colts. Hiking socks! Now Rich will be ready for hiking on vacation. 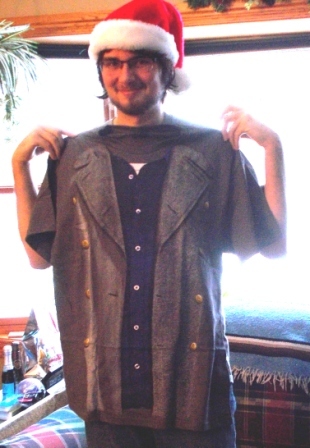 Rick had been asking for a Jack Harkness coat. The best he could do was a t-shirt with the coat imprinted on it. Hedgehogs for the dryer. This is a cool idea. They seem to work also. I got Rich a Fit bracelet to track his waking and sleeping. It would be interesting to see what it says about him. A chainmail pouch for ren faire. Rick wondered about it. 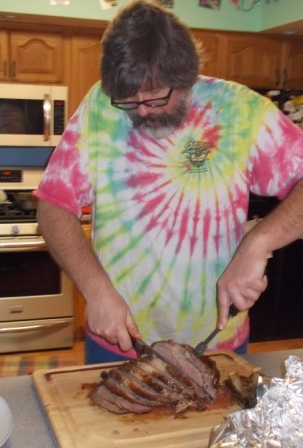 Rich carving the rib roast for our Christmas dinner. Sascha waiting for the birthday song and then a slice of cake.